Your sales team should always be looking for effective ways to attract new customers, cut down on customer acquisition costs (CAC), and increase customer satisfaction and retention (especially since some level of customer churn is unavoidable). But do you know how much each new customer is worth to you once they’re acquired? If not, then how do you justify marketing and sales budgets? 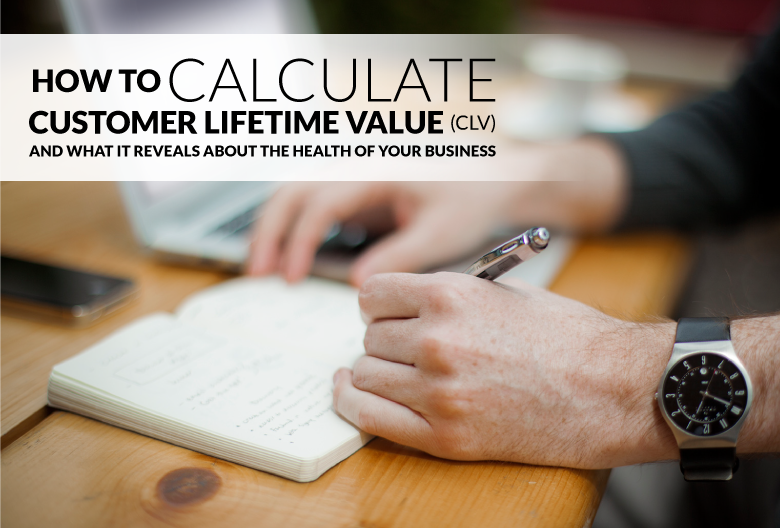 Understanding your customer lifetime value allows you to predict how much revenue a new deal will bring in over the course of the customer relationship. 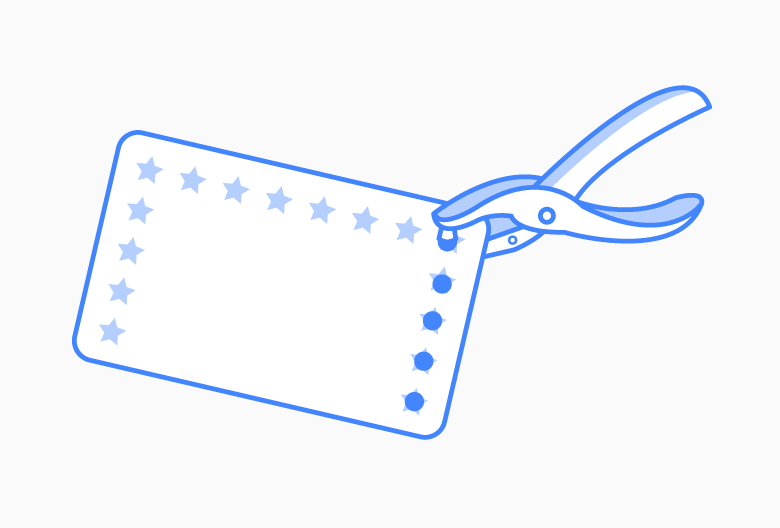 What is Customer Lifetime Value Exactly? Sometimes referred to as LTV (shortened from ‘user lifetime value’), CLV is one of the most significant metrics for businesses and should be measured at regular intervals. Looking at CLV can help you define clear marketing goals and sales strategies to reduce acquisition costs, improve retention, and encourage existing customers to spend more over their lifetime with your company. How much can we comfortably spend on marketing and sales for customer acquisition? How much should we spend on customer service to retain an existing customer? Who are our most valuable customers and how can we better target this demographic for future sales? Remember, not all customers are equally valuable. For most businesses, a small cohort of specific customers is generally the most profitable. Assessing your CLV can allow you to dedicate more resources toward the acquisition and retention of high-value customers – thereby increasing profits overall. One of the most valuable applications is using CLV to frame a better understanding of your customer acquisition cost (CAC). 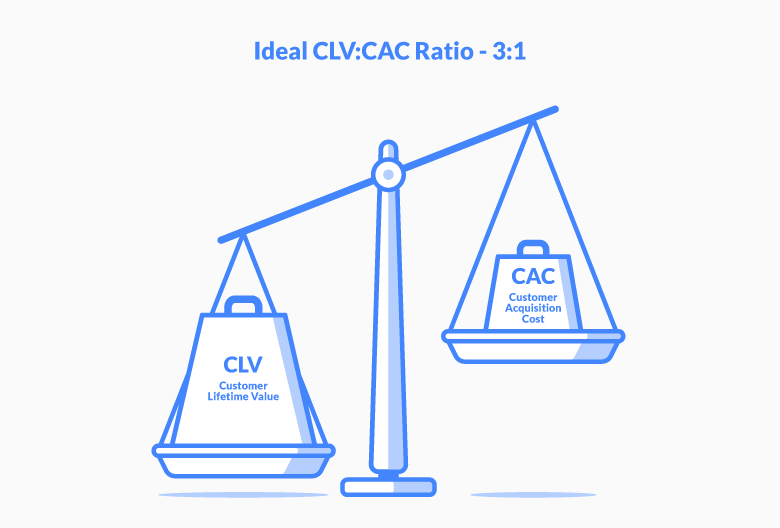 Your CLV:CAC ratio reveals a lot about the health of your business model. 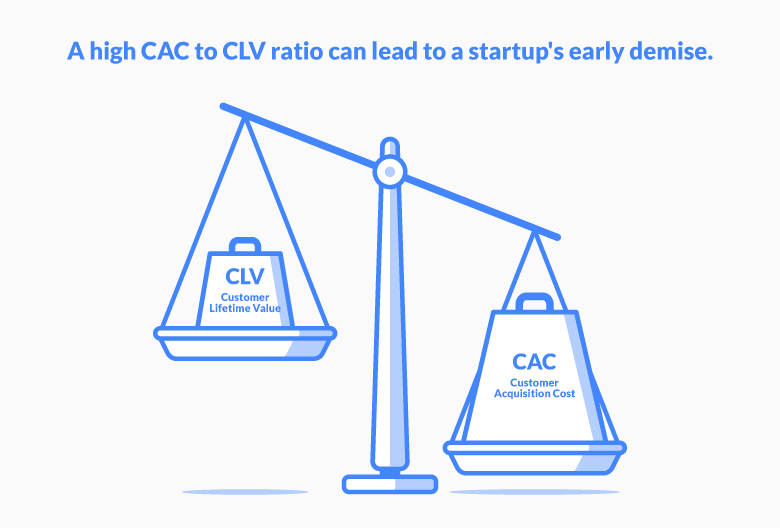 Many startups and small businesses struggle to grow because their CAC is higher than their CLV. Once you calculate CLV, you can focus on optimizing this ratio – which ensures your business continues to grow at a healthy rate. Without measuring CLV, a business might be spending too much to acquire customers whose lifetime value simply isn’t worth the cost. Once you’ve identified your most valuable group of customers, you can focus on providing customer service tailored to their needs to ensure they stick around as long-term clients. The most basic way to determine CLV is to add up the revenue earned from a customer (annual revenue multiplied by the average customer lifespan) minus the initial cost of acquiring them. Let’s say a SaaS company generates $3,000 each year per customer with an average customer lifetime of 10 years and a CAC of $5,000 for each customer. Not bad, right? Looking at your CLV through this lens makes it easier to justify the sales and marketing budgets required to land new customers in the first place. The simple approach can be used if a customer’s annual profit contribution remains somewhat consistent. For example, if you run on a subscription-based model with only one or two tiers, then each your customers can be expected to provide a relatively stable source of revenue. On the other hand, if your annual sales per customer are not relatively flat, a more in-depth CLV equation is needed. This traditional version of the formula takes rate of discount into consideration and provides a more detailed understanding of how CLV can change over the years. This traditional method allows for fluctuations in customer revenue over time and each year is adjusted by a rate of discount to account for inflation. If you’re not sure what rate of discount is appropriate, consider that a rate of 10% is commonly used by SaaS companies. Now that you know what your CLV is, you can take action to increase it and improve your CLV:CAC ratio. Not sure what ratio you should be aiming for? Most resources suggest a ratio of 3:1 as a safe minimum for SaaS companies. Incentivize repeat purchases and you’ll automatically increase retention along with the lifetime value of your customers. Repeat customers are always more profitable than those who make a single purchase - and they cost less to retain than acquiring a new client. Offering better customer service and a consistent user experience will keep your clients satisfied and lengthen your average customer lifespan. This also allows you to recognize opportunities for upselling and cross-selling, which would further boost your CLV. 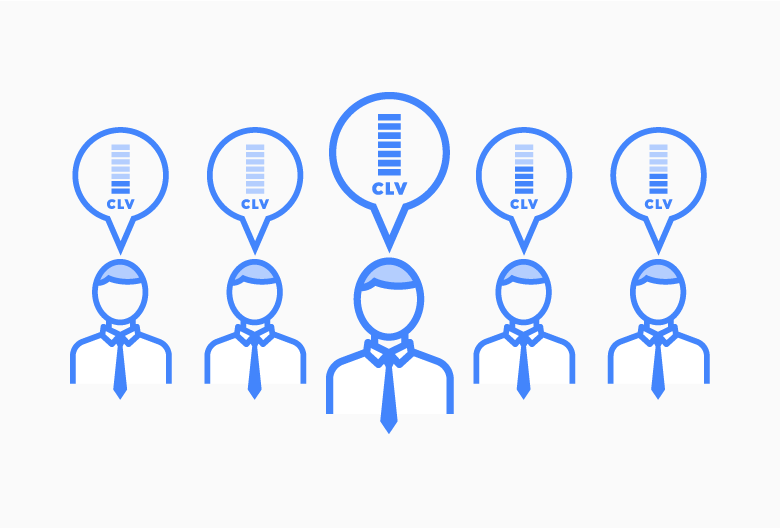 When you calculate your current CLV, you can identify your most profitable customer type and use that information to improve your CLV going forward. Refine your marketing to target those high-value customers who are more likely to make repeatedly bigger purchases throughout their lifespan. Remember, improving CLV isn’t the only thing necessary to grow your business. Another key factor to look at in conjunction for LTV is your customer acquisition cost. Aim to increase your LTV and decrease your CAC for an optimal LTV:CAC ratio that will bring you long-term success. Another way to reduce CAC is to use a CRM like Propeller. Want to spend less time on data entry and tracking while generating more leads through cold email? Start your free trial today so you can focus on making connections and landing new customers.